All this chit chat about falcons has got me keen to show off my latest shots. I have been spending a fair bit of time out and about in inland Hawkes Bay, and hence have bumped into a few lately. Anyway, the other day I took my gear out with me and got a couple of shots I am pretty pleased with. The bird in the pictures appears to be an adult male. On two consecutive days he was seen hunting in the same area, the second day (8 June 2006) being when I had my gear with me. Amazing how they just don’t mind flying past you within a couple of metres. Anyway, he was actively hunting, and would perch for a few minutes in a prominent spot. Then having sighted something would head out over an extensive basin with limestone outcrops on the other side. I saw several unsuccessful attempts where he flew to birds 600+ metres away, that he had clearly seen from his perch. He would gradually gain height as he headed towards the birds, flying above them and then stooping towards them. They would dive and the chase would be on. These first attempts he returned with no prey. 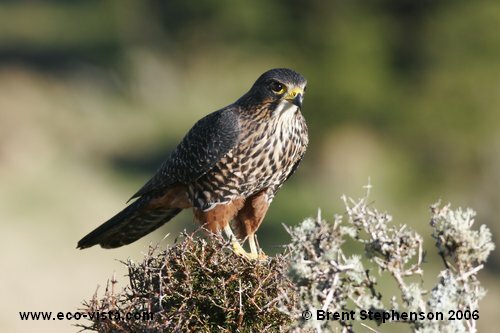 However, on one attempt he headed off out over the basin, gaining height, to a point about 600m away, and about 200m up from the ground. He dived for 60-80m and I saw what he was diving at just as he hit it, a small finch I think. Got a couple of distant shots of him carrying the bird, as he headed back towards me. He landed in a tree about 150m away and I thought I was going to have a repeat of the time I had the bird devouring a chaffinch 20m away – see the photos in my gallery – www.eco-vista.com However, I got to where he was and saw him perched wiping his bill, and suspect he had just cached the prey for later. There definitely wasn’t enough time to have devoured the bird. Strange thing is he was then straight back into hunting mode! Not three falcons in one shot, but a composition of three shots of the same bird as it left its perch to hunt. 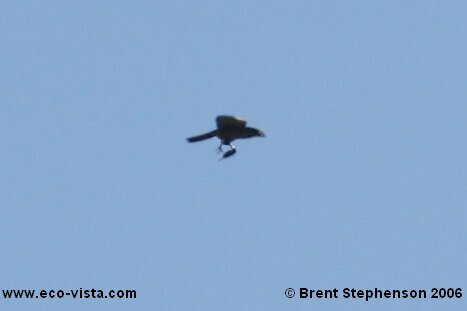 Prey captured, it looks like a finch, possibly a chaffinch, but difficult to say – this is a 100% crop.